Tinney's Tavern and the Mulleyville Snowmobile Club making residents re-think port-o-potties since '86. Nothing breathes life into a frigid winter day like sailing across a frozen lake on an old toilet bowl. 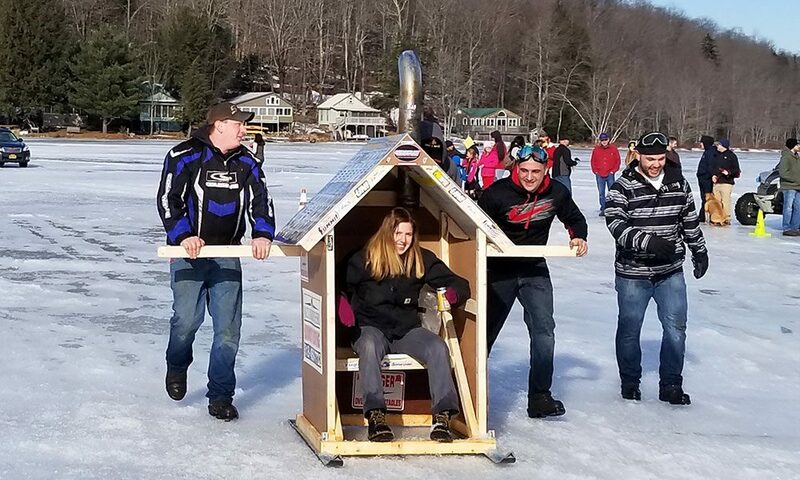 Just ask the 500 attendees of this year’s Outhouse Races, held at Lake Desolation on January 28. 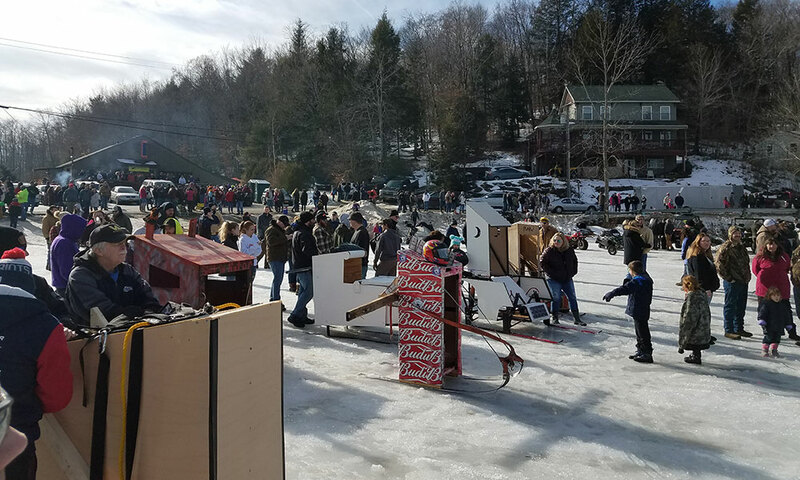 Since 1986, Tinney’s Tavern and the Mulleyville Snowmobile Club have joined forces to put on the whacky event, a crowd-pleaser with a loyal following—that also happens to be one of the most reliable of the winter season: At an elevation of 1,600 feet, Lake Desolation is always frozen solid, making for the perfect outhouse racing conditions. “It’s an excuse to get out of the house in the middle of the winter for a fun, comical time with the community,” says Kevin Joyce, Tinney’s owner. For those unfamiliar with the ins and outs of outhouse racing, the official rules state that all competing lavatories have three walls and a toilet seat, leaving room for a wide range of design strategies to slip and flip across the ice. Participants build their own racing loos, homemade structures built atop skis, so their port-o-potties level up from portable to race-able. Some sport flames on the sides or look like something out of the old Speed Racer cartoon; others look kind of like skiing doghouses. One even has the traditional moon-sliver insignia cut into both sides. Within each unique exterior sits a courageous “driver,” operating the latrine with nerves of steel. Not that he or she has any control. In fact, many of the outhouses are occupied by young children. The true feats of athleticism and balance are performed by the racing teams, three- to five-member crews that push and pull their contraptions 30 yards across Lake Desolation to cross the finish line. “It’s a riot,” says Joyce. “Teams get dressed up in comical outfits, outhouses flip, team members slip, fall…” This winter, Team POT ROD earned the coveted title of 2018 Outhouse Race Champs, channeling the discipline and endurance of a pack of sled dogs as they trounced ten other teams in double elimination. It’s no small feat racing an outhouse—or watching someone else do it from the sidelines, for that matter. So Tinney’s Tavern provides the fuel all day long, serving burgers, hot dogs and wood-fired pizza at a stand on the frozen lake itself. And for those looking for a little more, the Tavern offers their full menu indoors and on their deck, as well as a number of drink specials provided by co-sponsor Artisanal Brew Works. If you’re jonesing for a good outhouse race, we have some good news for you: Lake Desolation’s isn’t the only one in town. Lake George also has its own (check the Winter Carnival schedule for more information).